The hamlet of Labastide benefits from a great location with beautiful natural scenery and many pretty villages nearby reputed for their gourmet food markets. There are a host of activities to satisfy every visitor with cultural tours, sporting activities or even gastronomic discoveries. History fans will love the magnificent castles of the Dordogne such as ﻿Beynac﻿, Castelnaud and Les Milandes. The castle of Bonaguil is an absolute must see! The unmissable town of Sarlat-La-Canéda, capital of the "black diamond" (truffles), foie gras and gastronomy. Medieval villages such as Domme and Monpazier as well as La Roque-Gageac, built into the cliffs above the Dordogne river. 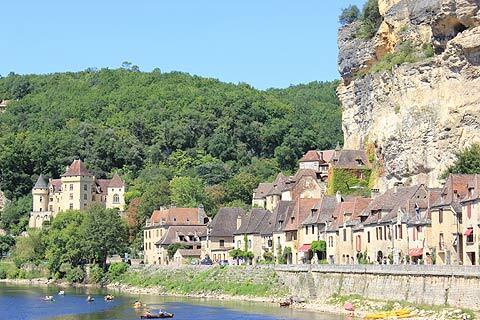 Rocamadour, the most beautiful village in France and an important location on the pilgrimage route. The basilica of Saint-Sauveur is also an unmissable part of the Way of St James. Saint-Cirq Lapopie, a listed medieval village, was voted "Best French Village" in 2012. Cahors, the capital of the Lot region with its turreted Pont Valentré bridge, the Saint Étienne Cathedral with its secret gardens or, for wine connoisseurs, you can go on the Cahors vineyard tours. Food lovers will be spoilt for choice with the produce in this beautiful region: foie gras, cepes mushrooms, truffles, chestnuts and the famous lamb, nuts and melon from Quercy. Those who prefer more cultural attractions will love the numerous museums in the region; Musée Zadkine, Quercynoise des Vieilles Mécaniques, SauveTerre Musée de Préhistoire, Musée de Gajac. Or they can visit Les Arques with its roman churches. The valleys of the Lot and the Dordogne, as well as numerous lakes with leisure parks will satisfy those who like to swim, fish or take sightseeing trips on the river. Visiting the caves of Lascaux, Lacave, Cougnac, Peche Merle and Merveilles and the grotto at Padirac will allow you to immerse yourself in the prehistoric period of this region and they are refreshing on summer days when it is too warm.